The state tournament MVP was a big reason why the Bullpups won the Class 4A state title. Anton Watson’s goals are simple. “I want to be remembered,” he said. As a basketball player, Watson is becoming unforgettable. Reflect on Gonzaga Prep’s run through the Class 4A state basketball tournament, and the 6-foot-7 junior was a constant highlight. Dunking on a 7-foot-4 opponent. Hitting a game-winning three-pointer. Playing lockdown defense. Watson was everywhere in leading the Bullpups to the program’s second state championship of the decade. But the postseason performance was merely an extension of what the Gonzaga commit has done all year. 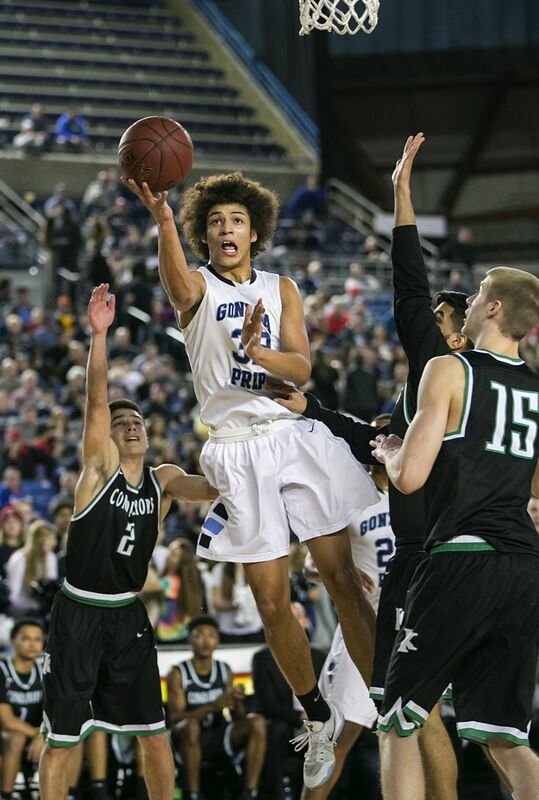 And for his efforts, Watson is The Seattle Times’ boys state player of the year. In the state semifinal against Richland and the title game against Federal Way, the Bullpups were down at halftime. In each game, it was a surge from Watson that spread through the team. And in each, it was with a display of his varied skills that has him ranked as one of the top 60 recruits in the nation by 247Sports.com for the Class of 2019. Against Richland, Watson used a left-handed dribble-drive to the left side of the hoop and leapt for a two-handed dunk against Riley Sorn, a 7-4 center. To avoid a second overtime against the Bombers, Watson grabbed an inbounds pass and spun around to hit a right-handed three-pointer before the final buzzer for a game-winning shot. Watson and his teammates struggled from the free throw and three-point line in the title matchup against Federal Way. It was his work in the paint and help on defense against the Eagles’ four-star recruit, Jaden McDaniels, that sealed the win. G-Prep outscored Federal Way 34-24 inside, totaling 17 points off turnovers to cap a 27-0 season. Watson is the youngest child of an athletic family. His father Deon remains Idaho’s all-time leader in career rebounds (877), starring for the Vandals from 1990-94. His older brother, Deon Jr., played wide receiver and tight end for Idaho (2013-16) while sister Haile is a starting middle blocker for Fresno State’s volleyball team. Anton’s earliest memories are trying to dribble a basketball when his father played professionally overseas. Basketball was an immediate love, and Watson wants to use the platform to bring awareness to charitable work. The vision of how or what isn’t clear, yet. For now, the Greater Spokane League MVP just knows he wants more. And Watson is hard to forget. F Kevin Porter Jr., Rainier Beach, 6-5, Sr. The USC commit was named MVP of the Metro League after averaging 28 points and 12 rebounds per game during the regular season. Beach finished as Class 3A state runner-up. F Jaden McDaniels, Federal Way, 6-9, Jr. The co-MVP of the NPSL Olympic Division led the Eagles to a Class 4A state runner-up finish. He averaged 21.3 points, 10 rebounds and 4.6 blocks during the regular-season. F Anton Watson, Gonzaga Prep, 6-7, Jr.
Named the Class 4A state tournament MVP, the Gonzaga commit averaged 21.9 points and 8.1 rebounds. G PJ Fuller, Garfield, 6-4, Jr. The four-star recruit averaged 17.7 points, 6.8 rebounds, 5.0 assists and 3.2 steals per game during the Bulldogs’ regular season. Garfield won the Class 3A state championship. G Erik Stevenson, Timberline, 6-4, Sr. Broke six Class 3A state tournament records, including total points (118), in a program-best fourth-place finish. The Wichita State commit averaged 24.7 points and 7.1 rebounds. G Brock Ravet, Kittitas, 6-1, Jr. The Gonzaga commit averaged 31 points, 9.0 assists, 8.8 rebounds and 3.3 steals per game in leading the Coyotes to their second consecutive Class 2B state championship. Was named Gatorade state player of the year.